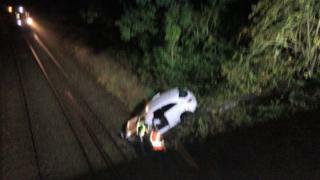 A car crashed through a fence and went down a steep bank, narrowly avoiding being hit by a passenger train. The oncoming train was able to stop short of the car and the woman driver was unhurt in the crash, West Midlands Ambulance Service said. The accident happened near Wythall station in Lea Green Lane, near Birmingham, on Tuesday evening. An ambulance spokesman said the car stopped about 1ft (30cm) short of the railway track. "It is incredibly fortunate the woman was uninjured and the oncoming train managed to stop short of the incident," the spokesman said. A spokesman for train operator London Midland said the driver had helped to take care of the motorist. "Not only did the driver safely bring the train to a halt, he cared for the welfare of the car driver and, along with the senior conductor, our passengers on board the train service," he said. The service involved was the 21:26 from Stratford-upon-Avon to Stourbridge Junction. Image caption The car, which had one person in it, crashed through a fence and went down a bank.